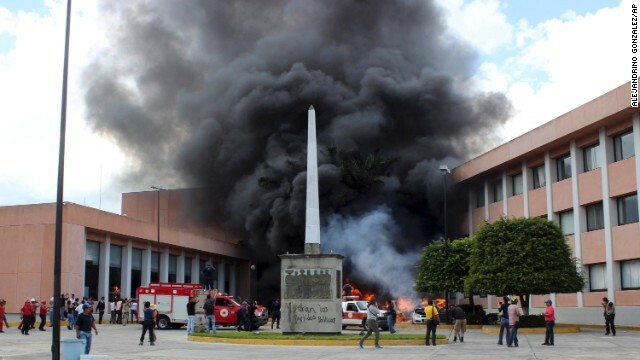 Protesters angry at the apparent death of 43 students torched vehicles in front of the state Congress building in Chilpancingo, Mexico, on Wednesday, November 12. The students disappeared in southern Mexico in September. Authorities say they were abducted by police on order of a local mayor, then turned over to a gang that's believed to have killed them and burned their bodies before throwing some remains in a river. 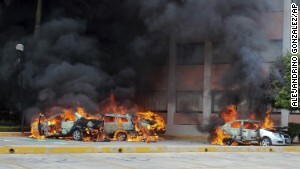 Cars burn in front of the state Congress building in Chilpancingo on Wednesday, November 12. Authorities have arrested Iguala Mayor Jose Luis Abarca, called the "probable mastermind" in the mass abduction, and his wife, Maria de los Angeles Pineda. 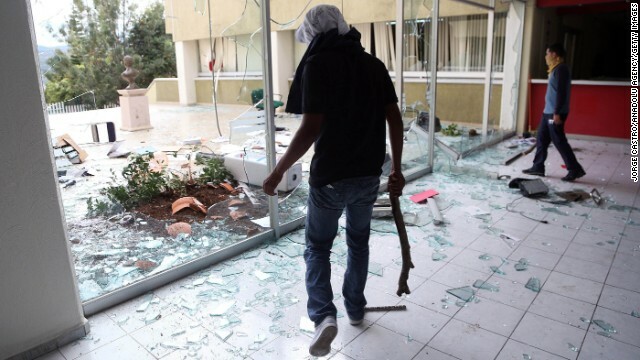 Protesters damage the headquarters of the Institutional Revolutionary Party on November 12 in Morelia, Mexico. 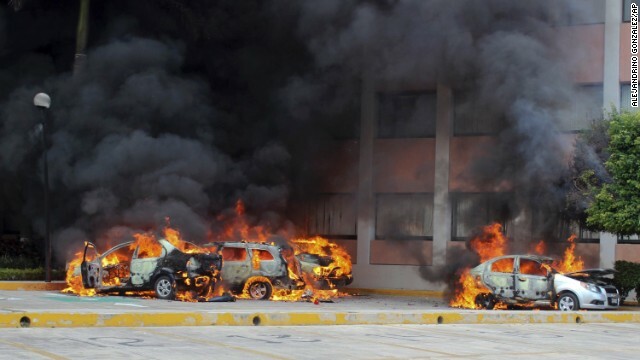 The Iguala incident has sparked protests across Mexico. 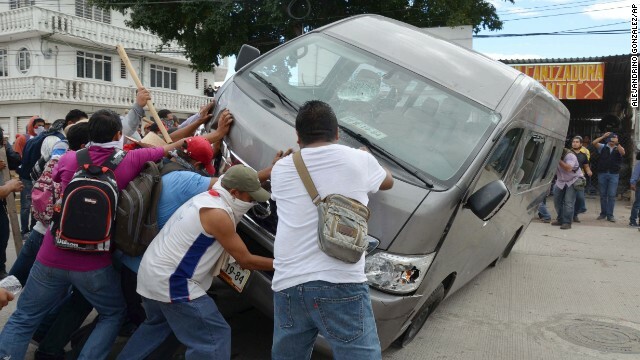 Protesters flip a vehicle during a clash with riot police in Chilpancingo on Tuesday, November 11. 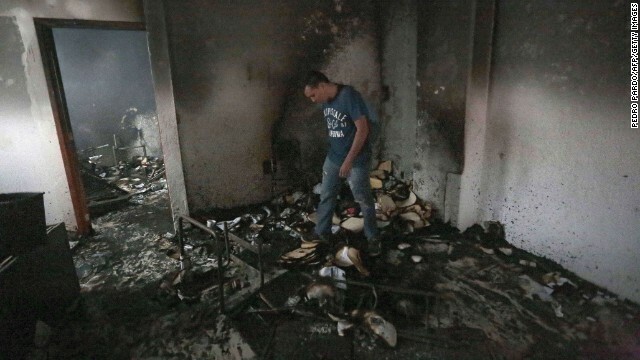 A man walks through rubble after demonstrators set the Institutional Revolutionary Party's headquarters ablaze in Chilpancingo, Guerrero state, Mexico, on November 11. People confront the riot police during a protest on Monday, November 10. A wounded riot police officer is rescued from violent demonstrators on November 10. 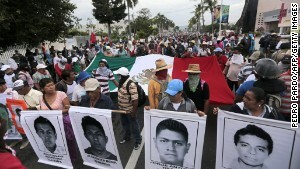 Protesters march in Acapulco on November 10. Riot police stand guard near the airport in Acapulco on November 10. 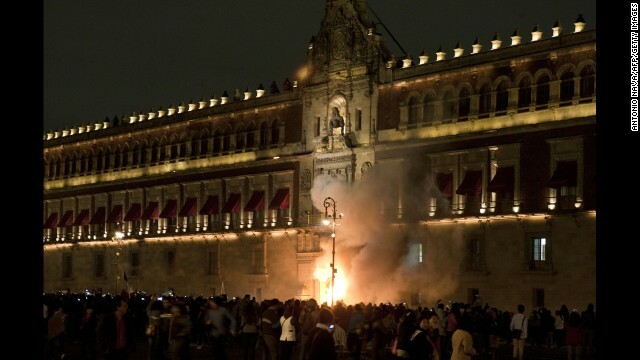 Protesters set fire to the main entrance of the Mexican National Palace during a demonstration in Mexico City on Saturday, November 8. 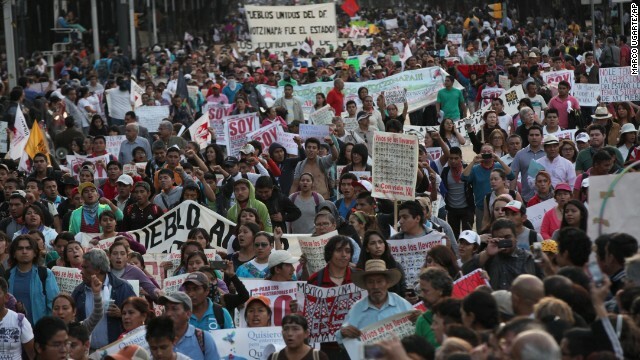 Tens of thousands of demonstrators march in Mexico City on Wednesday, November 5, demanding that the missing students be found alive. Editor's note: Jose Carreño Figueras is the foreign news editor at Global, a free-standing international news section of the Excelsior newspaper in Mexico City. The opinions expressed in this commentary are his. 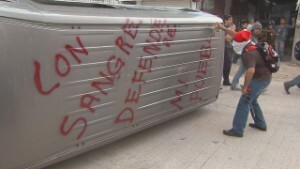 (CNN) -- Mexico has seen a cascade of political scandals that have shaken the country the last few months, most notably the now well-publicized bloody incident in which 43 teaching students were "delivered" by the Iguala city police to a drug trafficking group, who murdered them under the belief that they were sent by a rival gang. To use a cliche, it was the straw that broke the camel's back, a strong indication that Mexico's people are no longer willing to tolerate the current state of affairs. Some have suggested that the government will fall, and others have said Mexico is a failed state. The Mexican government does not appear ready to fall, not even close. But it seems to be in a defensive situation, maybe waiting for the tempest to wane so that it can regain the political initiative. It is, in many ways, a crisis of confidence. It is as if all the problems that were not attended to through history were appearing together: the impunity allowed to wrongdoers, the politicization of justice, the corruption, the perceived interaction of different levels of authorities with organized crime, the inefficiency of the police... and on and on. In other words, the wrongdoers appear to get away with murder. Right or wrong, there is the feeling that the whole system is compromised. 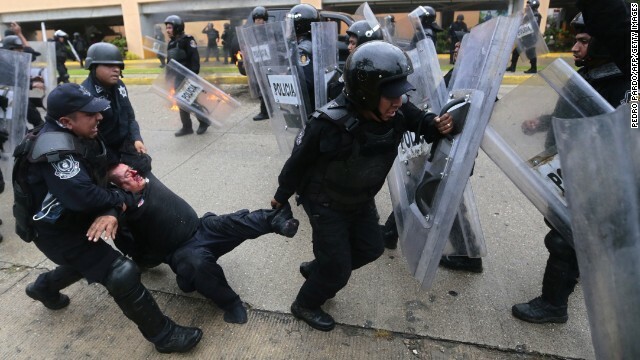 The authorities do not appear to be able to control the violent gangs that have plagued the country for the last 10 or 15 years even if they claim that a big part of the violence has been the result of the breakdown of the major drug cartels. But then again, they do not appear to be able to contain the more or less contrived violence present in some of the protests, in the last few years. 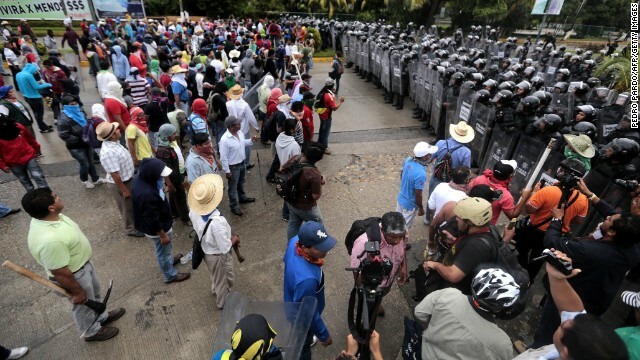 Yes, the seemingly small thievery, small vandalism in some demonstrations -- even the attempt to burn a gate to the National Palace -- pale in comparison to the drug violence that have caused more than 60,000 deaths in the last 10 years. Appearances could be misleading, but there is little help for the government in the images of apparent police impotence before the small-scale vandalism of supposed students and the increasing damages caused by so-called anarchists. It may be that the authorities will try publicly to present a merely defensive strategy, to avoid bigger problems. The country is still traumatized by the bloody repression of the 1968 students movement. 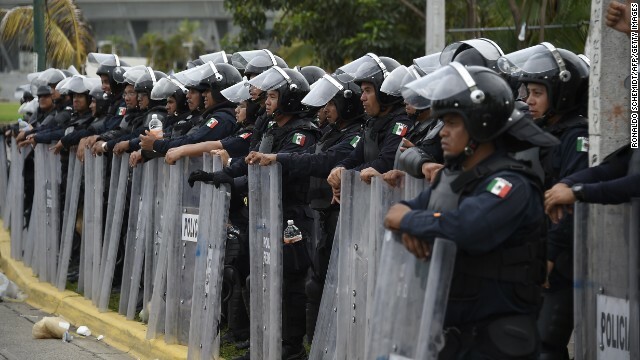 The Mexico City authorities have allowed more than 2,000 demonstrations annually, for several years now, and Mexico City's inhabitants are somewhat inured to the demonstrations that do not break windows or throw a dump truck against a police barrier. Then again, the images are there. This last 12 months have been the frame for huge corruption scandals that have cost the country billions of pesos -- and cost institutions like Citigroup a few hundreds of millions of dollars; cases like Oceanografia (that defrauded PEMEX and banks equally), like Grupo Mexico (that allegedly polluted an agricultural region in Sonora state and appears rightly or wrongly to have escaped with minimal costs) and more recently the decision to overturn a bidding contest to build a railway because of the complaints of some of the international participants. These cases are more or less in the docket but people do not have confidence in our judiciary system and the legal maneuvering that it allows. And then of course, there is Iguala. The disappearance of the 43 students hit a nerve and has become an open wound in a way that is truly unprecedented.